Sadly Ben Bernanke's video and slides are not up on the website. Ben showed some very interesting evidence that the crisis was an unpredictable run, rather than the usual story about predictable defaults resulting from too much credit. Things really did get suddenly a lot worse in September and October 2008. Yes, it's easy to say this is defense against the charge that he should have done more ahead of time. But evidence is evidence, and I find it quite plausible that the relatively small losses in subprime need not have caused such a massive crisis and recession absent a run. Ben says the material is part of a paper he will release soon, so look for it. One can understand that Bernanke is careful about releasing less than perfect drafts of papers and videos. Barry Eichengreen gave a scholarly account of why history matters, especially the great depression, and we should pay more attention to it. (Paper, video.) He aimed squarely at typical economists whose knowledge stopped at Friedman and Schwartz, or perhaps Ben Bernanke's famous non-monetary channels paper, in which bank failures propagated the depression. He emphasized the role of the gold standard and international cooperation or non-cooperation, and warned against facile comparisons of the gold standard experience to today's events and the euro in particular. Randy Kroszner has a great set of slides and an engaging presentation. He also started on parallels with the great depression, and told well the story of the US default on gold clauses. He closed with a warning about fighting the last war -- particularly apt given the exclusive focus of most of this conference on the events of 2008 -- and on how to start a crisis. In his view when Bank of England Gov Mervyn King said: “We will support Northern Rock." People hear "Northern Rock's in trouble? Run!" Likewise, in my view, speeches by President Bush and Treasury Secretary Paulson did a lot to spark the run in the US. 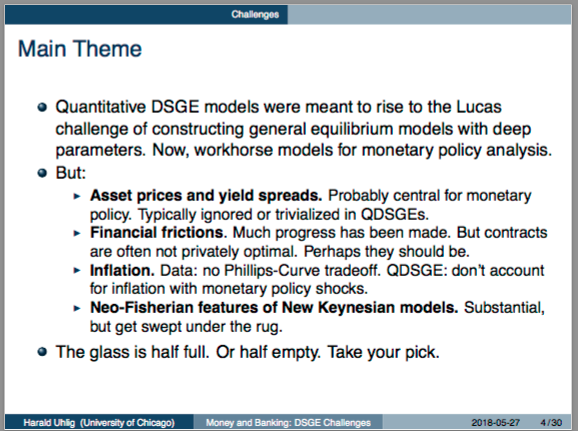 A highlight for me, was the session on DSGE models. 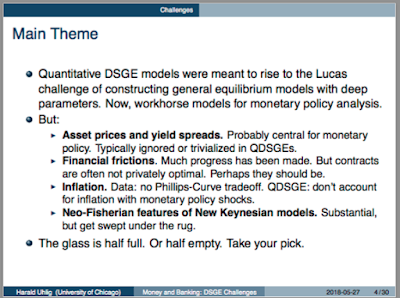 Marty Eichenbaum (video, slides, subsequent paper) gave a nice review of the current status of new Keynesian DSGE models, and how they are developing in reaction to the financial crisis and recession, and the zero bound episode. Financial frictions are blossoming in DSGE models, in two forms: First, HANK or "heterogenous agent" models, which add things like borrowing constraints and uninsurable risks so that the distribution of income matters, and in an eternal quest to make the models work more like static ISLM. Second, in response to the financial crisis (see first day!) stylized models of banking and intermediary finance are showing up. I'm still a little puzzled that the more standard time-varying risk aversion part of macro-finance got ignored, (a plea here) but that is indeed what's going on. The conundrum, here as elsewhere in DSGE, is that the more people play with the models, the further they get from their founding philosophy: macro models that do talk about monetary policy, (now) financial crises, but that obey the Lucas rules: Optimization, budget constraints, markets, or, more deeply, structures that have some hope of being policy invariant and therefore predictions that will survive the Lucas critique. Already, many ingredients such as Calvo pricing are convenient parables, but questionably realistic as policy-invariant. Harald points out that since most of the frictions are imposed in a rather ad-hoc manner, neither will they be policy-invariant. This is a deeper and more realistic point than commonly realized. Every time market participants hit a "friction," they tend to innovate a way around that friction so it doesn't hurt them next time. Regulation Q on interest rates was once a "friction," and then the money market fund was invented. The result is too often "chicken papers:"
The understandable trouble is, if you try to microfound every single friction from Deep Theory -- just why it is that credit card companies put a limit on how much you can borrow, in terms of asymmetric information, moral hazard, and so forth -- the audience will be asleep long before you get to the data. Also, as we saw in day 1, there is (to put it charitably) a lot of uncertainty in just how contract or banking theory maps to actual frictions. I think we're stuck with ad-hoc frictions, if you want to go that route. Harald's next point is, I think, his most devastating, as it describes a huge hole in current models that is not (unlike the last two) a point of immense current research effort. The Phillips curve and inflation are the central point of the New Keynesian DSGE model -- and a disaster. Essentially all inflation is accounted for by the shock. The model is basically silent about the source of inflation. 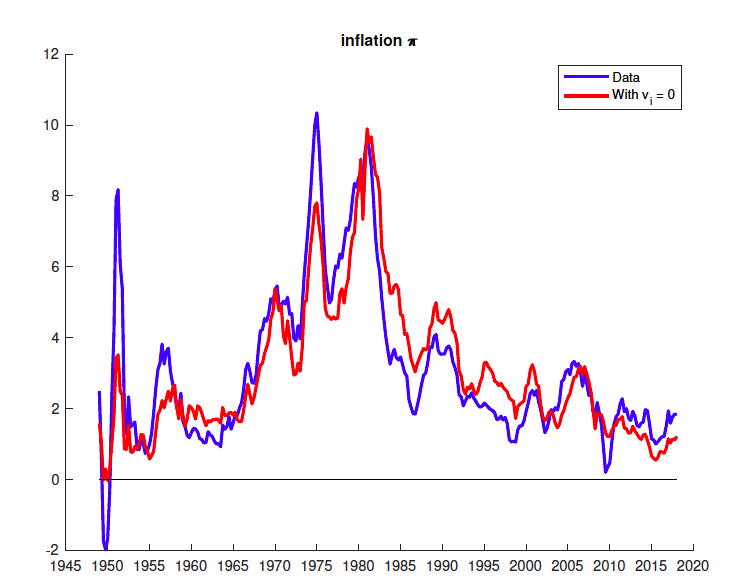 Looking at the model as a whole, not just one equation, Neither monetary policy shocks nor changes in rules accounts for any significant amount of inflation. 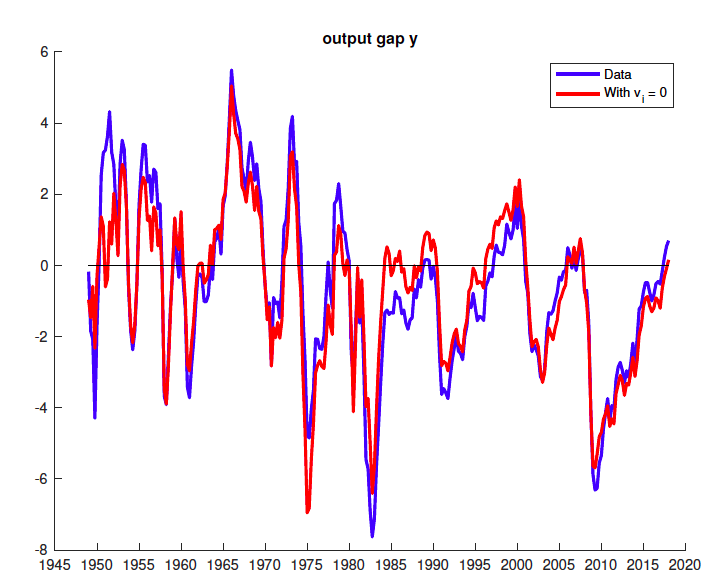 Now, use actual data on output y, inflation pi, and interest rate i, to back out the shocks v. Turn off the monetary policy shock vi = 0. Solve the model and plot the data -- what would have happened if the Fed had exactly followed the Taylor rule? 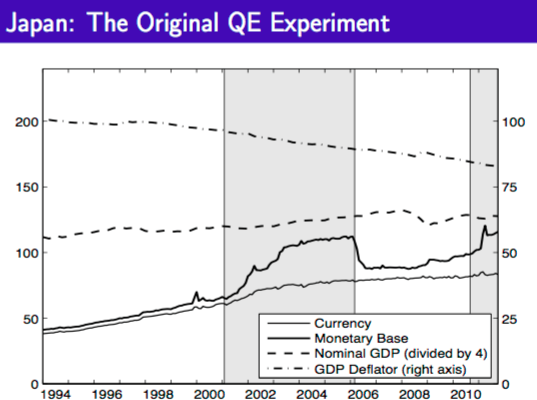 QDSGE: don’t account for inflation with monetary policy shocks. The NK / Phillips-Curve-based NK QDSGE models may thus provide a poor guide for monetary policy. 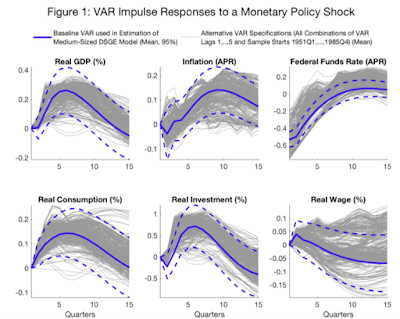 Wait, you ask, what about Marty Eichenbaum's pretty graphs, such as this one, showing the effects of a monetary policy shock? The answer: After a lot of work, the effects of a monetary policy shock look (at last) about like what Milton Friedman said they should look like in 1968. 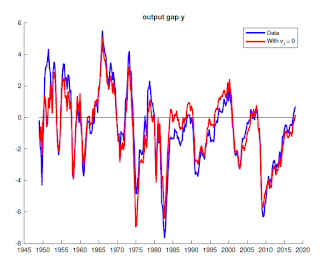 But monetary policy shocks don't account for any but a tiny part of output and inflation variation, quite contra Friedman (and Taylor, and many others') view. Last, standard new Keyensian DSGE models have strong "Fisherian" properties. In response to long lasting or expected interest rate rises, inflation goes up. More on this later. Ellen stole the show. (Slides.) Take a break, and watch the video. She manages to be hilarious and incisive. And unlike the rest of us, she didn't try to sheohorn a two hour lecture into her 15 minutes. What to do? Focus on rules and institutions. This is a deep point. 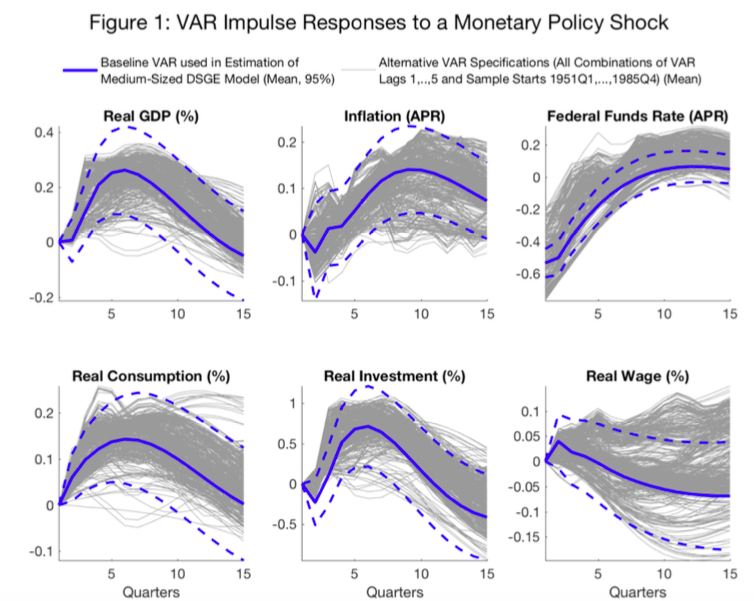 Even DSGE modelers, in the desire to speak to policy makers, often adopt the static ISLM presumption that policy is about actions, about decisions, whether to raise or lower the funds rate. The other big Lucas point is that we should think about policy in terms of rules and institutions, not just actions. Stephanie Schmitt-Grohé (slides, video) talked about the Fisherian possibility -- that raising interest rates raises inflation. New-Keynesian DSGE models, with rational expectations, have this property, especially for permanent or preannounced interest rate increases, and when at zero interest rates or otherwise in a passive regime where interest rates do not react more than one for one with inflation. She and Martin Uribe have been advocating this possibility as a serious proposal for Europe and Japan that want to raise inflation. She presented some nice evidence that permanent increases in interest rates do increase inflation -- and right away, not just in the long run. To what extent does this mean that the entire conceptual framework of monetary stabilization policy needs to be reconsidered, for a world in which ELB might well continue periodically to bind? In classic form, Mike sets the question up as a Ramsey problem. 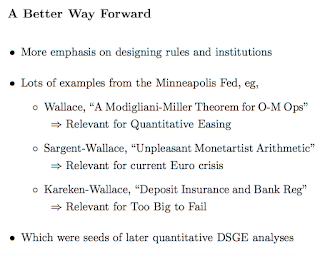 Given a DSGE model, what is the optimal policy, given that interest rates are occasionally constrained? He derives from that problem a price level target. The price level target works, intuitively, by committing the central bank to a period of extra inflation after the zero bound ends. It is a popular form of forward guidance. The innovation here is to derive that formally as an optimal policy problem. Mike's price level target is stochastic, changing optimally over time to respond to shocks. 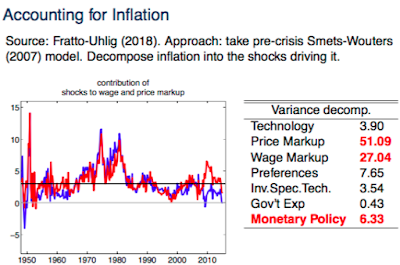 I'm a little skeptical that the central bank can observe and understand such shocks, especially given the above Uhlig-McGrattan discussion about the nature of shocks. Also, as I emphasize in comments, I'm dubious about the great power of promises of what the central bank will do in the far future to stimulate output today. I'm a fan of price level targets, but on both sides, not just as stimulus, but for utterly different reasons. Similarly, he likes the price level target over forward guidance -- speeches in place of action -- as it is a more credible commitment to do things ex-post that the bank may not wish to do ex-post. 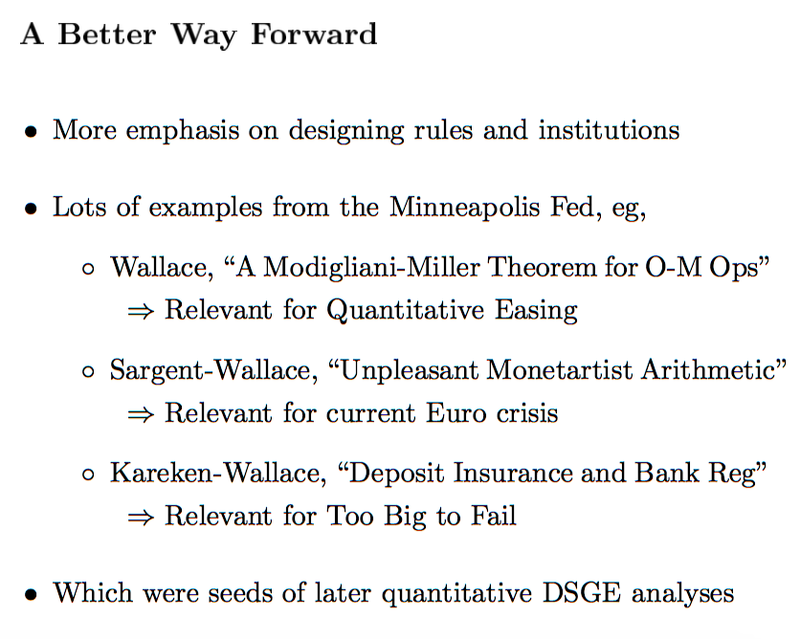 Finally, he addresses the puzzles of new Keynesian models at the zero bound -- forward guidance has stronger effects the further in the future is the promise; effects get larger as prices get less sticky, and so on. He argues that models should replace rational expectations with a complex k-step iterated expectations rule. "I never thought we would come to Sweden, that I would be defending the basic new-Keynesian program, and that Mike Woodford would be trying to tear it down. Yet here we are. Promote the fiscal equation from the footnotes and you can save the rest." Money demand shocks in the 1980s -- how the supposedly "stable" V in MV=PY fell apart when the Fed pushed on M.
How is it "monetary economics" without money? 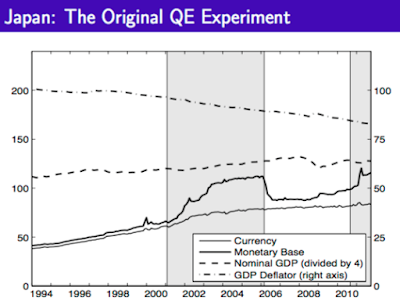 Why did immense QE not cause inflation? The overarching theme is the grand story of a move, intellectual and practical, from money supply targets (of which gold is one) to interest rate targets. Monday featured two panels, Macroeconomic research and the financial crisis: A critical assessment, with Annette Vissing-Jørgensen, Luigi Zingales, Nancy Stokey, and Robert Barro ; and Banking and finance research and the financial crisis: A critical assessment with Kristin Forbes, Ricardo Reis, Amir Sufi, and Antoinette Schoar. Perhaps it's in the nature of panels, but I found these a disappointment, especially compared to the stellar presentations in the main conference. Also I think it would have been better to allow more (any, really) audience questions; the whole conference was a bit disappointing for lack of general discussion, especially with such a stellar group. In particular, Luigi led by excoriating the profession for not paying attention to housing problems and financial crises. I thought this a bit unfair and simultaneously short-sighted. He singled out monetary economics textbooks, including Mike Woodford's, for omitting financial crises. Well, Mike omitted asteroid impacts too. It isn't a book about financial crises. And, after lamabasting all of us, he said not one word about events since 2009. What are we missing now? I had to stand up and ask that rude question, again suggesting that perhaps we are all not listening to Ken Rogoff this time. Annette went on to ask something like "don't you Chicago people believe in any regulation at all," and the respondents were too polite to say what an unproductive question that is and just move on. Again, I offer apologies to authors and discussants I didn't get to. The whole thing was memorable, but there is only so much I can blog! Do go to the site and look at the other sessions, according to your interests. Great blog post. The part about Marty's graphs is really thought provoking. Many papers seem to motivate a model based on these identified shocks, but as you mentioned, these can be quantitatively small. Do you think these conditional approaches are the best way to motivate a model? Well, not sure what Luigi said, but housing is worth a much, much bigger look, even in macroeconomic context. You can get 1000 economists to sign a public letter to Trump on trade tariffs (which as a fraction of GDP, seem rather inconsequential) but ongoing and pervasive property zoning and exploding house prices, and huge amounts of capital being sucked into housing...well, not often a topic. Let alone what housing costs are doing to living standards all along the West Coast. Well, the joke is there are no atheists in foxholes and no free-market libertarians when neighborhood property zoning is under review. And an economist who already owns a home does not find ending property zoning a compelling topic. BTW, this problem of exploding housing costs is global--see Great Britain, Australia, Canada, Hong Kong. People who cite Hong Kong as a free-market nirvana may want to explain why Hong Kong has unaffordable housing as rule. Is that what free-markets promise us? Rent immiseration? Re Ken Rogoff: Yes, let is anticipate the next debacle, not the last one. We can say we should have a balanced federal budget and we can say criminals should not commit crime. The question is, what do in the face of permanent budget deficits? If Rogoff says "balance the budget" then his (well-intentioned and intelligent) advice is useless. How do we forestall or stifle the next crisis, given perma-deficits? The Japan solution of chronic QE? As unpleasant as the task may be, I think macroeconomists need to contemplate policies in light of pervasive property-zoning and chronic federal budget deficits. Also, chronic national trade deficits and inflows of capital. 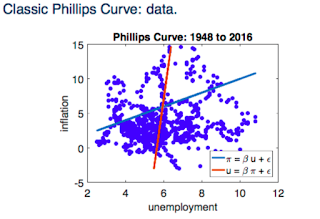 Also, not in light of the Phillips Curve, which might be better defined as the "Phillips Phlat-Line." We can say we should have a balanced federal budget and we can say criminals should not commit crime. It's no crime to create fiat and that's what Federal budget deficits do. The true crime is that citizens may not even use their Nation's fiat except in unsafe, inconvenient physical form, aka "cash". Thus the demand for fiat is artificially suppressed. Instead we have to work through what is, in essence, a heavily privileged usury cartel which extends what is, in essence, the public's credit but for private gain. There’s a glaring flaw right at the heart of monetary policy, assuming that by monetary policy one means interest rate adjustments: it’s that the optimum or GDP maximising rate of interest is presumably the free market rate. Ergo there shouldn’t be any interference with that rate at all. Milton Friedman and Warren Mosler quite rightly advocated a system where government and central bank simple create and spend whatever amount of new money is needed each year to keep the economy at capacity, while government borrows precisely and exactly nothing, and no attempt is made to adjust interest rates. Ralph M: Can you provide a cite? This is an idea that fascinates me, and yet is all but taboo in modern orthodox macroeconomic circles. BTE, Korekiyo Takahashi in Great Depression Japan went to money-financed fiscal programs, and Japan sidestepped most of the GD, while Western nations foundered. You would think Korekiyo Takahashi would be a chapter in a any book of macroeconomics or the GD, but he is the Invisible Man. Ben Bernanke also gave support of a sort for a system where stimulus comes in the form of simply creating base money and spending it (and/or cutting taxes) – which Keynes actually advocated in the early 1930s. See Bernanke’s Brookings article “What tools does the Fed have left? Part 3: Helicopter money.” See his para starting “So how could the legislature…”. There is a difference between Bernanke on the one hand and Mosler and Friedman on the other: Bernanke presumably wants the “print and spend” strategy limited to where interest rates have declined to zero, whereas Mosler and Friedman advocated the idea as a permanent policy. I watched a youtube of a panel session that had Luigi Zingale on it. Okay, Italians are often mesmerizing to watch, for their earnest declarations and animation. I confess weakness in this regard. But I think Zingale had a valid point: There are huge structural impediments and institutional frictions in the real world. Taking a page from Ken Rogoff, will the next debacle be caused not by "bad macroeconomic policy" but a powerful structural impediments and frictions embedded in the modern global economy (for which modeling does not account)? "Rather obviously, our recent recession was all about risk aversion -- people stopped consuming and investing, and tried to move from private to government bonds because they were scared to death, not a sudden attack of thriftiness." If that is the case, then the simplest solution is for the federal government to cease selling bonds and sell risk bearing assets (equity) instead. Assumption #1: Households enjoy a default risk free rate of return. Assumption #2: An individual household cannot offer a default risk free rate of return. Assumption #3: Government can offer a default risk free rate of return. Conclusion: Government should offer a default risk free rate of return. Except, by your logic above - the conclusion is wrong. As soon as governments start offering risk free rates of return, there is a possibility of recessions caused by individuals moving into risk free bonds. 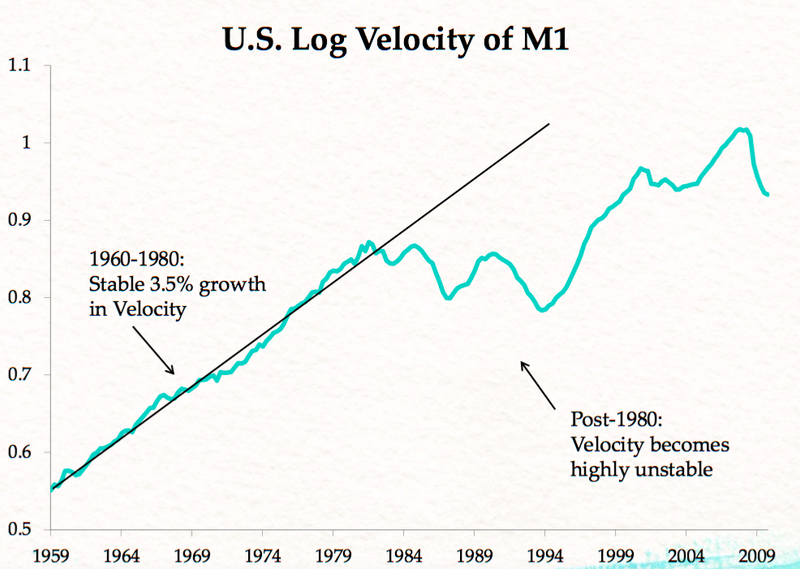 "Money demand shocks in the 1980s -- how the supposedly stable V in MV=PY fell apart when the Fed pushed on M."
You log graph depicts the growth rate in M1 velocity (not M1 velocity itself). 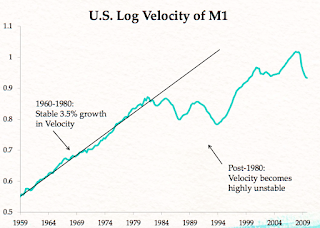 From 1980 thru about 1995, M1 money velocity was relatively stable fluctuating between 6.5 and 7.5. "Harald's next point is, I think, his most devastating, as it describes a huge hole in current models that is not (unlike the last two) a point of immense current research effort. The Phillips curve and inflation are the central point of the New Keynesian DSGE model -- and a disaster." Raise interest rates to curtail inflation, lower interest rates to promote real growth. 1. 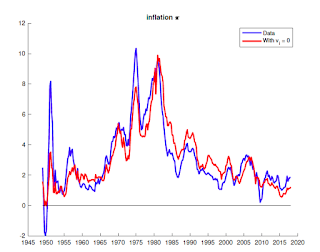 Monetary (credit) policy to respond to inflation and the growth rate of credit. 2. Fiscal policy to respond to real economic growth rate and the growth rate of it's own securities. Interesting and provoking Post, as quite often: I re-read it all a couple of times, to explain (first, to myself) why it leaves me in a state of uneasiness. As a practiotioner, I focussed in particular to the sections of the Post where the subject is asset pricing. I will start from the following: "Asset prices are a longstanding problem in DSGE models. In typical linearized form, the quantity dynamics are governed by intertemporal substitution, and the asset prices by risk aversion, and neither has much influence on the other." Right. So today's standard macro has basically no role for financial assets. And prices are determined by "risk aversion", as happens for apples and oranges. To me, this seems a great analytical limitation, becoming greater by the day. It is probably to be attributed to this mainstream theoretical approach, that many conclude that "the relatively small losses in subprime need not have caused such a massive crisis and recession absent a run.". But: is quite easy to prove the opposite. The Fed did not limit its actions to the subprime subsector, and instead bough a few trillions of securities, of different nature. Trillions. And, notice, never at market prices. The "run", 2007-2009 Vintage, was not a "1929-style" run. It was a "financial-market-centered" run, something totally different in nature. As said in Lucas, rules and institutions should be considered more carefully, before we enter the next, "market-centered" crisis, which in my view is inevitable since the excess of bank leverage that lead us to the GFC has simply been moved over to financial markets, but is today even greater.